1,0 sur 5 étoilesWhat I got wasn't a Belkin. The cable I ordered was a 25 foot Belkin. The seller who wound up providing the cable was Llectronics. They sent me some cheap, no-name knockoff in a plain, open, unlabeled plastic bag. It was 25 foot long, but not a Belkin. It didn't have any labeling on the cable itself or on the cable ends and the cabling was thin in diameter indicating poor quality. There was nothing provided which referred to the Belkin lifetime warranty. The real Belkins have "Belkin" molded on the cable ends and the cabling itself has information about the type of cable it is and the packaging clearly says Belkin all over it and states that the cable is warrantied for life. I didn't fall for this bait and switch tactic, and called Amazon to complain bitterly. I demanded a real Belkin with a lifetime warranty because that was what I had initially ordered. To Amazon's credit, they arranged to have a really-for-real Belkin 25 foot long cable sent to me via overnight and it arrived the next morning, clearly labeled and in a sealed Belkin package with the lifetime warranty written on it. It absolutely INFURIATES me when people are dishonest with me. If somebody tried to pull this on me in a brick and mortar store, I would have laughed in their face and refused the purchase as, I'm sure, would you. There is NO WAY that I'm going to allow a precedent to be established for such dishonesty by an online vendor (and I'm not referring to Amazon, but rather this "Llectronics" supplier.) If you buy this cable, make sure when one arrives that it is in fact a Belkin instead of some CHEAP, NO-NAME KNOCKOFF. Product appears well-constructed and works just fine; however, I found the design of the "snagless" connector unsatisfactory. The connector is very difficult to operate: seems I can't pinch the connector hard enough to get it to release when it's plugged into the computer port, and I was afraid of breaking the cable or damaging the computer port. My girlfriend, who has much smaller hands, had no better luck than I did. If you only infrequently connect and disconnect the cable, this issue shouldn't be a problem for you. In my case, where I regularly disconnect the cable, I ended up taking an X-Acto knife and trimming away the "snagless" piece of rubber, and I'm satisfied with the results. Cable produced by Belkin a couple of years ago was equally "snagless," but featured a better connector design. Seems a shame to purchase a product knowing you're going to have to modify it, so I've transitioned to the Mediabridge cable brand. 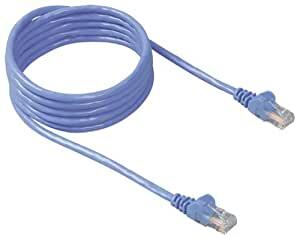 PS: This cable comes in two sizes: 25 feet and 50 ; So if you want to get connection from another room, make sure that you order the right one. We bought this item from one of the other vendors listed on Amazon under "more buying choices" -- PhoneSystemsAndChips, because it looked chepaer. We bought 4 of the cables. NONE of them worked. They would not stay plugged in -- the snap connection did not work on any of them. Note, I can't really get a refund because they structured the price so the item is really cheap, but the shipping was expensive. It looked cheaper overall, but once the product proved defective, the only thing you can get back is the really cheap item price, which was the smaller part of the purchase price. 5 personnes ont trouvé cela utile. I ordered both the Belkin 25 ft CAT 5e and the Belkin 50 ft. CAT 5e cables since I was not sure if the 25 ft cable would be long enough --- as it turned out the 25 ft cable was just what I needed so I did not use the 50 ft. cable. The 25 ft cable comes in Belkin packaging and markings but (like other reviewers stated) the 50 ft. cable comes in a plastic bag that says made in China and there is no indication that the cable is a Belkin. The 25 ft cable works perfectly. I gave this cable 5 stars but would give the 50 ft cable only 2 stars because it does not appear to be a Belkin product.